1. Pre-heat oven to 100 C Fan, 200F, Gas mark 1/4. Line one or more baking trays with parchment paper. 2. In a mixing bowl beat egg whites until stiff. Start by beating on a low speed and then increase to a high speed. When the mixture is stiff add the sugar very slowly one teaspoon at a time while continuing to beat. Make sure that the mixture is stiff after each addition of sugar. 3. Once all the sugar has been added continue to whisk on high speed until you have a smooth, stiff and glossy mixture. Continue to whisk for at least 5-10 minutes after the sugar has been incorporated. 4. Place mixture in a pastry bag with desired tip and pipe out your kisses onto the prepared cookie sheet. If you wish you can colour your drops by adding food colouring gel strips inside your pastry bag before filling. 5. 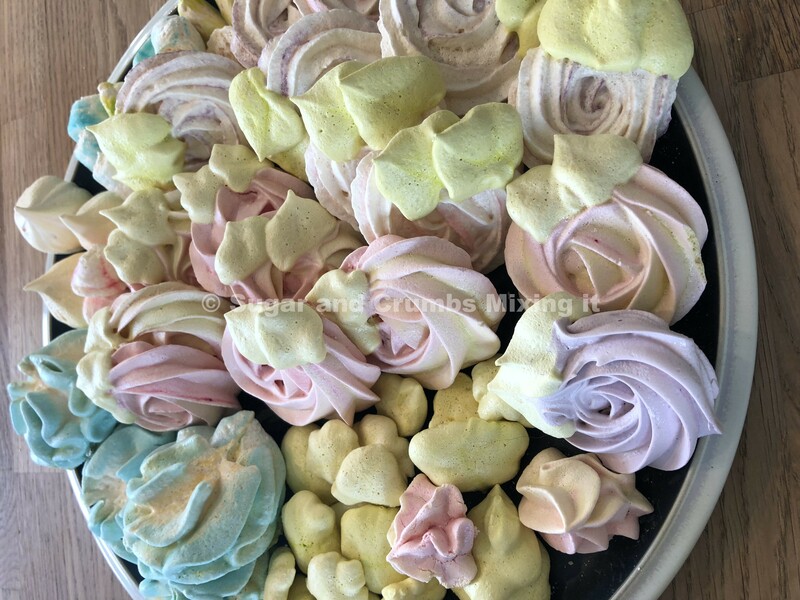 Bake for approximately 35-45 minutes or until the meringue kisses come off the parchment paper cleanly and without sticking. Then turn off the oven. Place the handle of a wooden spoon in the door of the oven (to leave a small opening) and leave the meringue in until the oven is completely cool. Serve or store in an air tight container for up to two weeks. 150g grams of Sugar and Crumbs Natural Flavoured Icing Sugar of choice. 1. Put the cream and the sugar in to a clean mixing bowl and beat until thick and creamy. 2. Fill piping bags, pipe on to one side of your flower or large meringue. Then add another flower or large meringue on top.